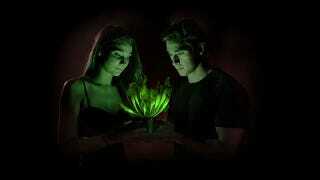 Perhaps you remember the wildly successful but also controversial Glowing Plant Kickstarter. Perhaps you're even patiently waiting for your glow-in-the-dark seeds, due to arrive in…September 2014. For the less patient among you, another company has beat the Kickstarted folks to the glow-in-the-dark punch. St. Louis-based Bioglow will be auctioning off twenty glow-in-the-dark cultivated tobacco plants, called "Starlight Avatar," starting January 31. This is your chance to be one of the first people out there to have your very own glow-in-the-dark plant. It's actually not surprising that Bioglow has come out ahead here. Aside from the whole GMO controversy, the Kickstarter project raised some eyebrows because the team hadn't actually created a glow-in-the-dark plant yet. (But hey, that's just Kickstarter for you, right?) In fact, one of the scientific reports the Kickstarter team cited was this PLoS One study, led by an Alexander Krichevsky, aka the founder of Bioglow. He's been quietly working on his own glow-in-the-dark plant company this whole time.